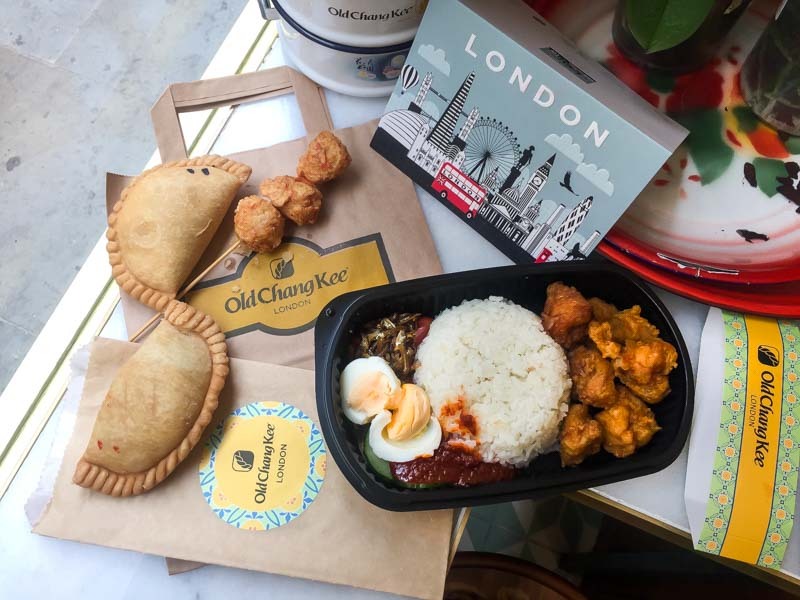 Have you ever been in a foreign land, surrounded by angmoh food and thought to yourself, “Wow, I would pay good money for a proper plate of chicken rice or nasi lemak”? That’s me every week or so in London, and a few days ago, part of that dream came true. 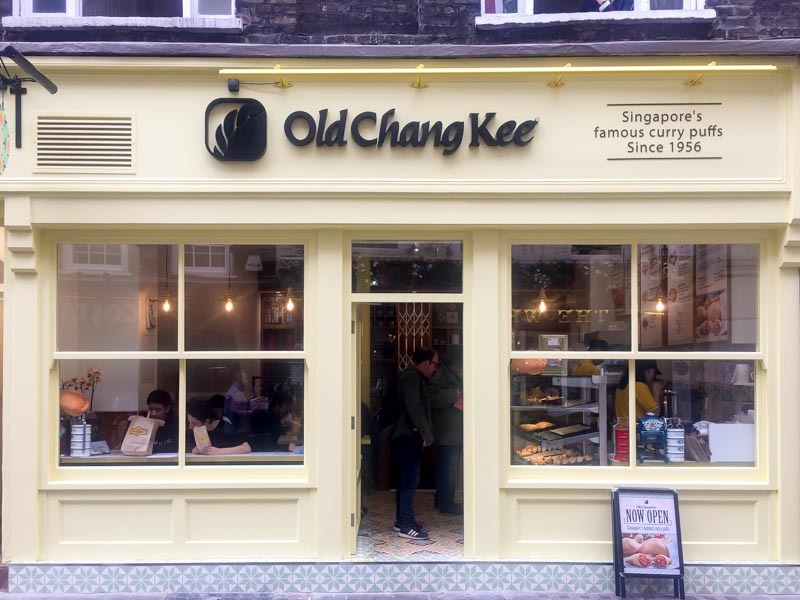 I know it’s not that hard to find good Asian food in this capital city, but sometimes the soul (and tummy) just craves the familiar – and Old Chang Kee is as familiar as it gets. 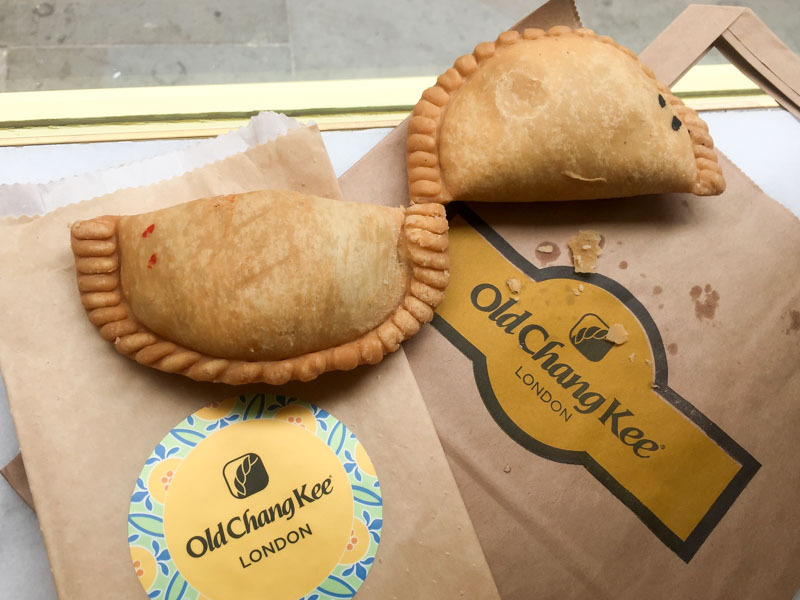 Our nation’s favourite curry puff chain finally opened an outlet in Covent Garden this June 2018, to the delight of Singaporeans in the United Kingdom. 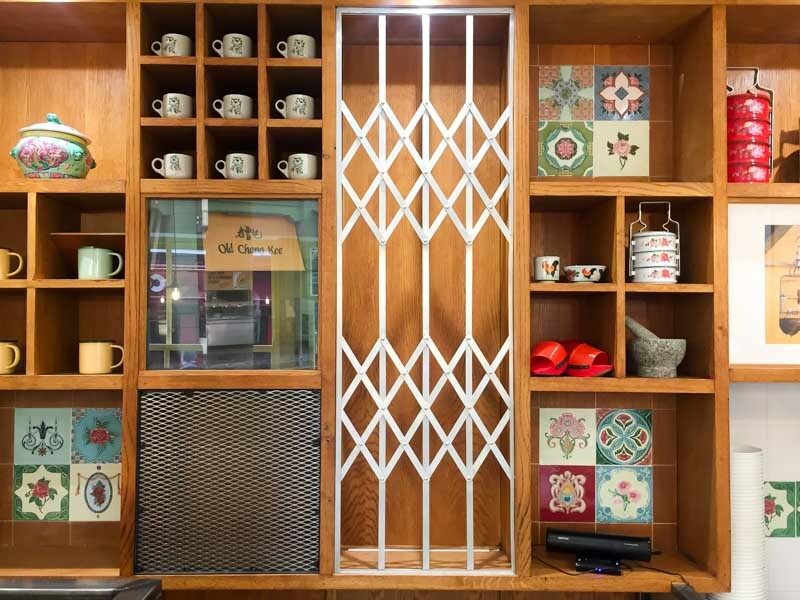 The eatery features a small seating space, furnished with Singaporean nostalgia and little Peranakan touches, characteristic of the Old Chang Kee chain and its related restaurants like Curry Times. I’ll admit, a wave of comfort washed over me as soon as I spotted the staff clad in the iconic yellow uniforms. I guess what most of you want to know is…what exactly from the menu have they brought over and how much more expensive is it? Well, don’t expect the usual grab-and-go fare; I was slightly disappointed that they didn’t have the whole range of deep fried goodies that I could smother in chilli sauce. But I guess that would be pushing it, I should just be grateful that I can get a legit curry puff. 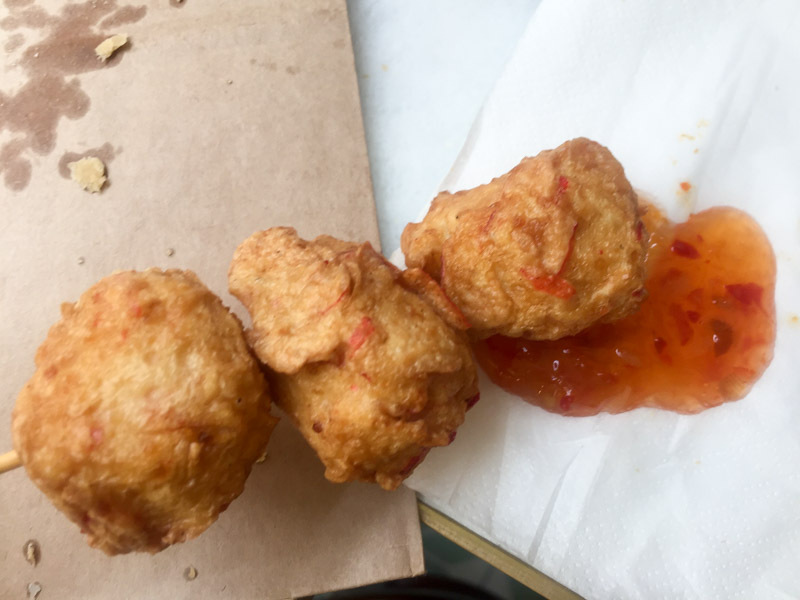 I only saw some Crispy Chicken Bites, Lobster Ball Skewers, Fish Ball Skewers and Vegetarian Spring Rolls in the display cabinet. 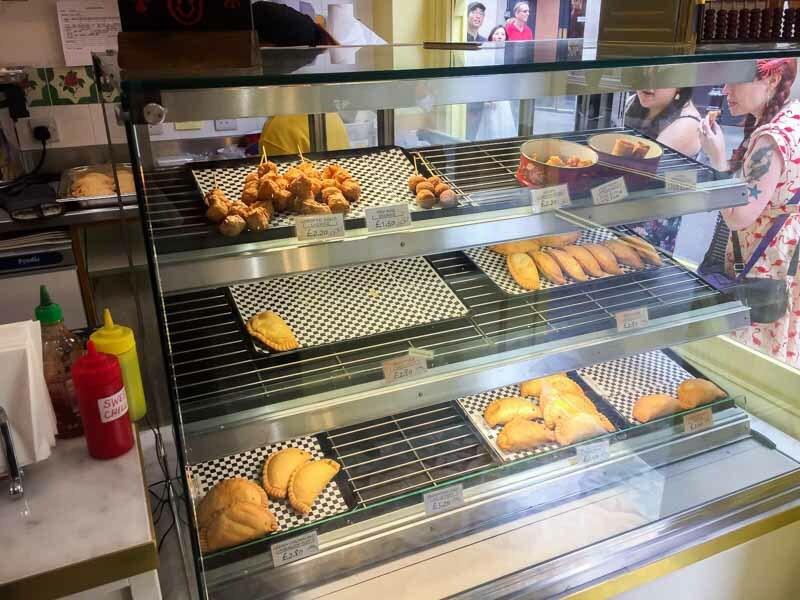 And of course, they had a selection of curry puffs, and more than I thought they would have, actually. 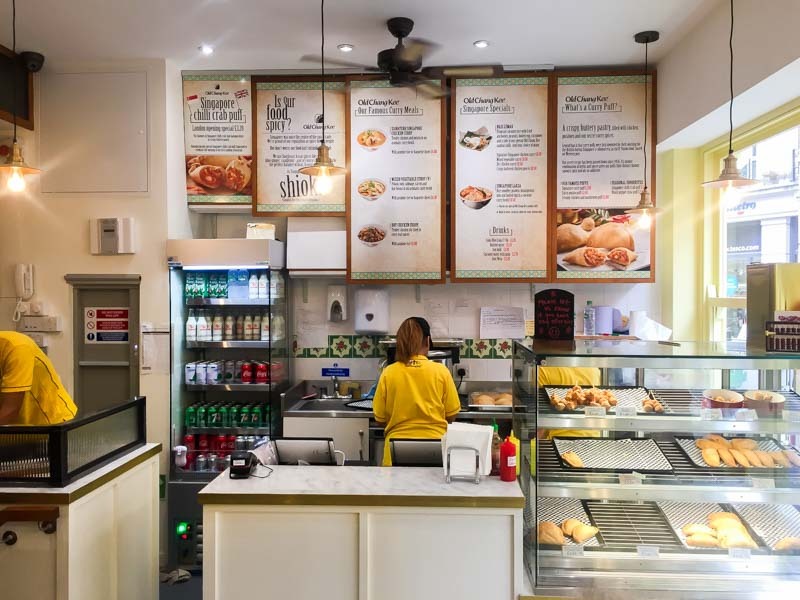 ‘Our Famous Puffs’ include the Signature Curry Puff (£2.80, approx. S$5), Curry Potato Puff (£2.60, approx. S$4.65) and Creamy Chicken & Mushroom Puff (£2.80, approx. S$5). They also offer ‘Seasonal Favourites’ like the opening special Singapore Chilli Crab Puff ( £3.20, approx. S$5.70), and the Black Pepper Tuna Puff (£2.90, approx. S$5.20). Much to my delight, they also serve up a few mains like the ‘Signature Curries’: Signature Singapore Chicken Curry (£6.80, approx. S$12.20), Mixed Vegetable Curry (£6.30, approx. S$11.30) and Dry Chicken Curry (£6.80, approx. S$12.20). I also got excited when I saw Nasi Lemak and Singapore Laksa (£8.50, approx. S$15.20), but was slightly taken aback by the prices. 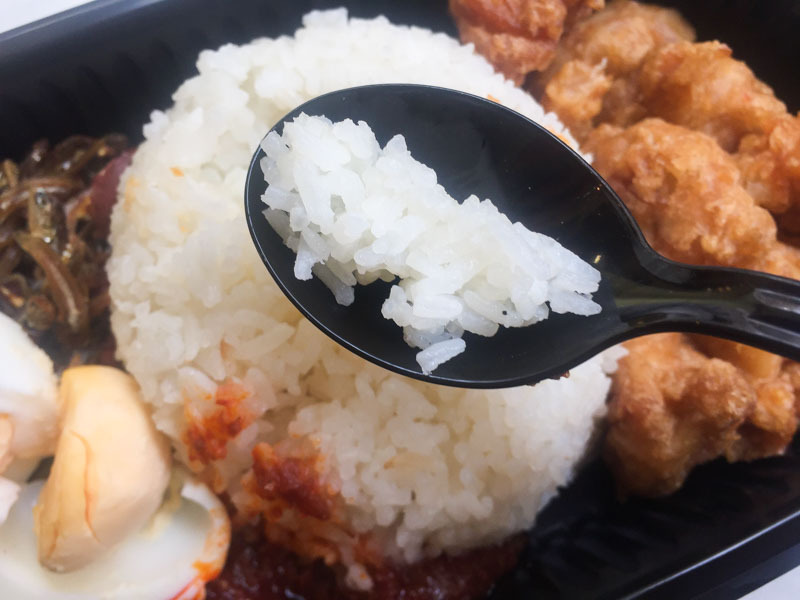 S$15 for Nasi Lemak?? This had better be good. 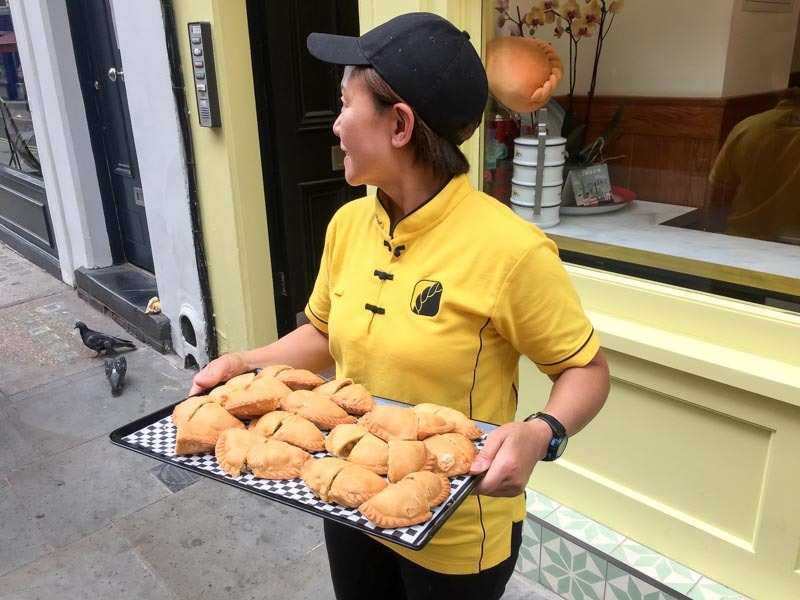 The curry puffs seemed to be what they were pushing the most, with tasters being sent out to tempt curious British folks. I even heard the cashier recognise a few return customers (it only opened a few days ago ah), so the reception has been good. 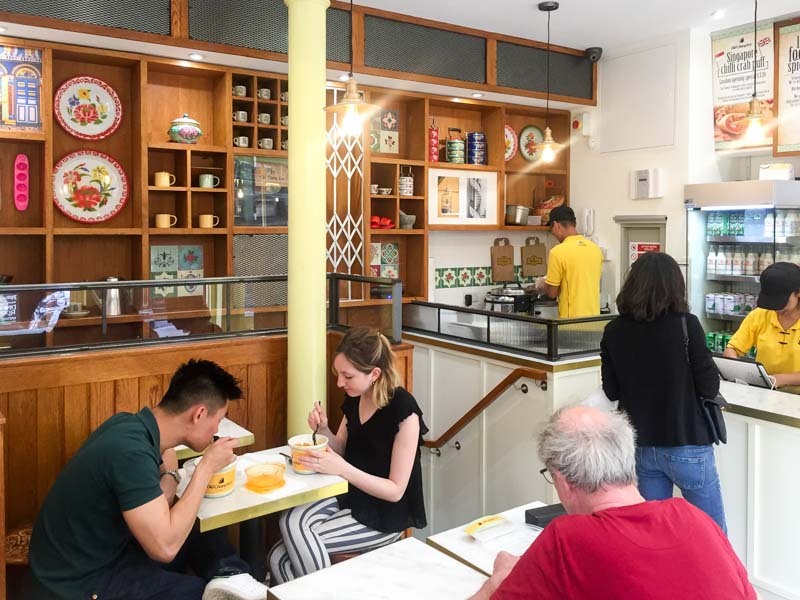 Overall, they weren’t really serving anything out of the norm, and the main difference seemed to be in terms of prices, which was to be expected. I got a bit of a feast for myself and braced for shiok-ness. The most popular curry puff seemed to be the Singapore Chilli Crab one, and I waited patiently for a fresh batch. S$5 for one curry puff? It was so worth it. There were chunks of seafood sticks (or “crab meat”) and a bit of heat from the chilli mix which really hit the spot in the slightly cooler weather. 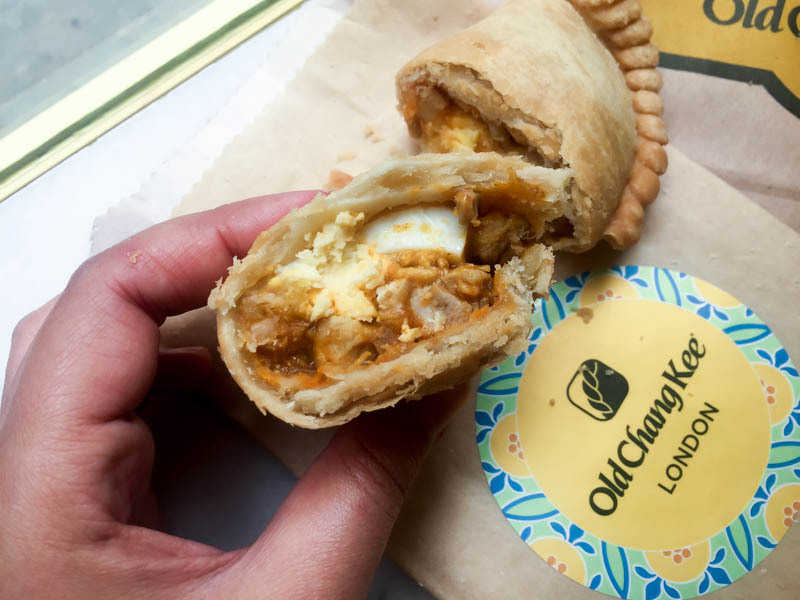 The curry puff casing was the same, wonderfully flaky pastry that we get in Old Chang Kee Singapore – this definitely exceeded expectations. 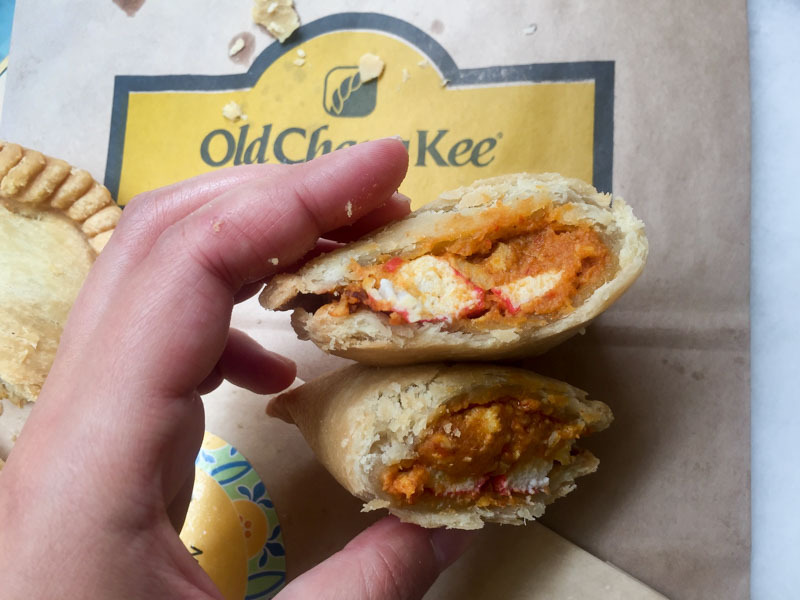 I’d also really been missing the Signature Curry Puff and got the one with the boiled egg inside. I am proud to confirm that it tasted just as good as the ones back home, if not better, given the novelty of having it fresh and hot, thousands of miles away. The Nasi Lemak on the other hand, was a bit more heartpain to fork out for, with a slightly less satisfying pay-off. 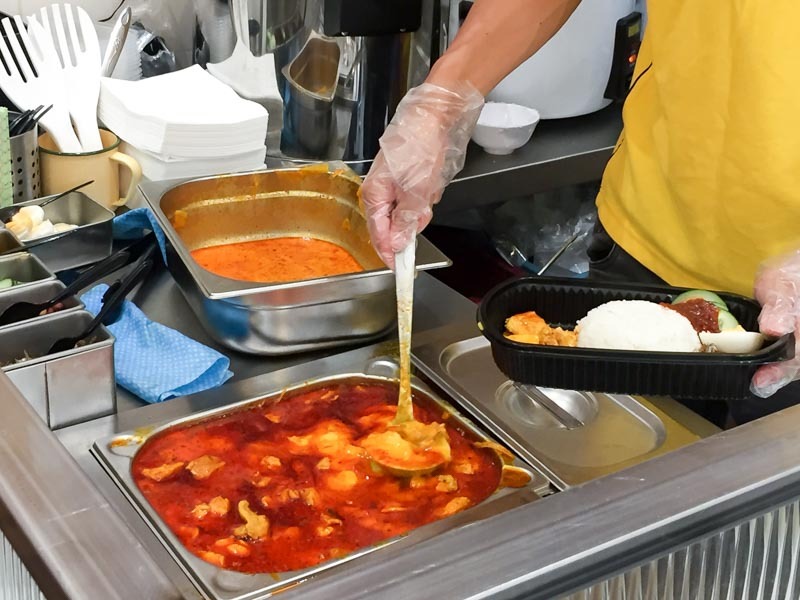 I saw some of the other customers eating the laksa which looked good, but I just happened to be craving rice that day, so I went for the Nasi Lemak with Crispy Battered Chicken Pieces (£8.50, approx. S$15.20). 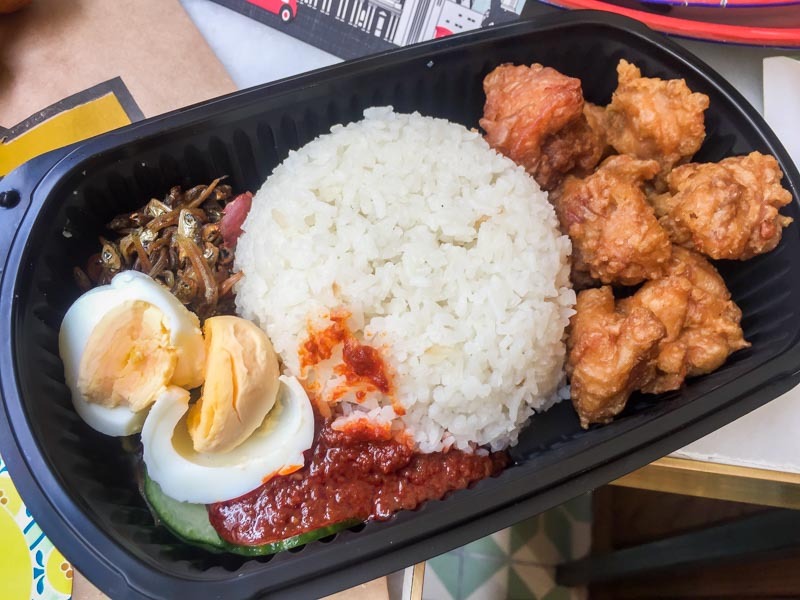 You can also get the Nasi Lemak with one of the Signature Curries instead. 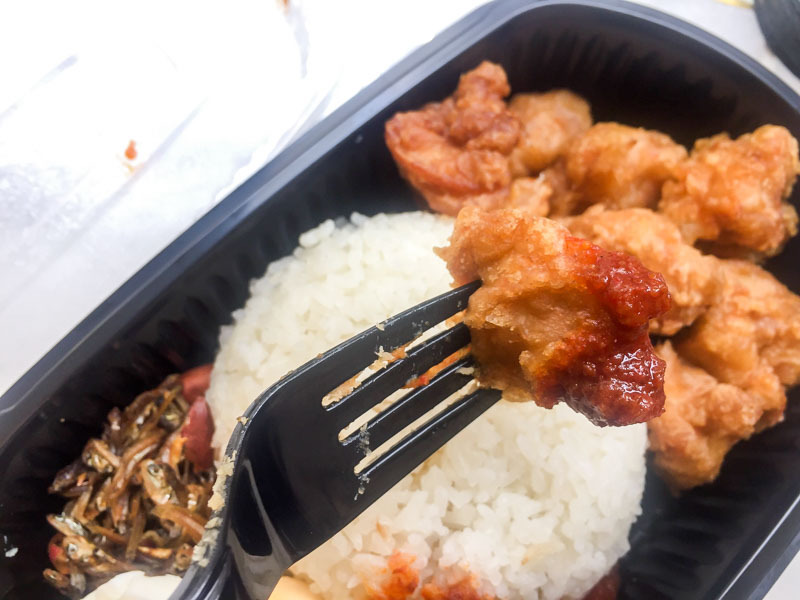 The Crispy Battered Chicken Pieces were essentially like bits of Japanese chicken karaage, and were delicious together with the special Old Chang Kee sambal chilli. There was nothing to really complain about all the usual nasi lemak accompaniments, but they were nothing much to shout about either. The sambal had a good kick to it, and the coconut rice was quite fragrant. Like I said, I definitely felt the pinch when I paid for it and thought that it could have been slightly cheaper, but again, beggars can’t be choosers. I guess it’s something I would treat myself to now and then, but I’d still probably just come back for the curry puffs. The biggest let-down however was the Lobster Skewer Balls (£2.20, approx. S$3.95), given that I know how much (or how little) “lobster” is actually in them. I’m sorry but not even the sweet chilli sauce could make me forget that I was forking out S$4 for three atas fish balls. I’ll probably just wait until I make my annual pilgrimage back home to stuff my face with these deep-fried treats. Ah, but friends, when you’re really craving something legit and don’t have it readily available, value-for-money concerns take a bit of a backseat. 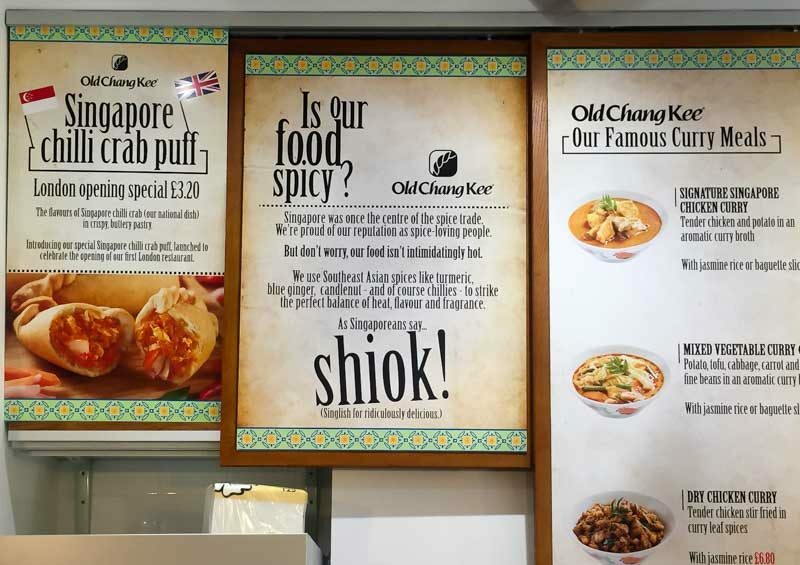 Old Chang Kee, thank you for giving us locals a real taste of home and for exciting the palates of all my angmoh friends.